Unbelievable Wedding Ranch wedding is something unique, something different in the Las Vegas wedding scene. In the city, but on 3 acres of land with manicured pine trees, shrubs, and evergreens and views of the mountains to the west & the Las Vegas Strip to the East! Swimming pool, inside and outside locations for the reception, pool table, poker table, tree house, lampions, trampoline, dance floor was all part of the wedding package and just gave different locations to the different age groups to have fun! This was a perfect choice for their Las Vegas wedding, since the grooms family arrived from Europe, so they could spend the weekend together! Flowers and decoration was created by European Touch Landscaping for the wedding! The bride's dress and pink shoes was just amazing! Her shoes really stands out on this deep photo. 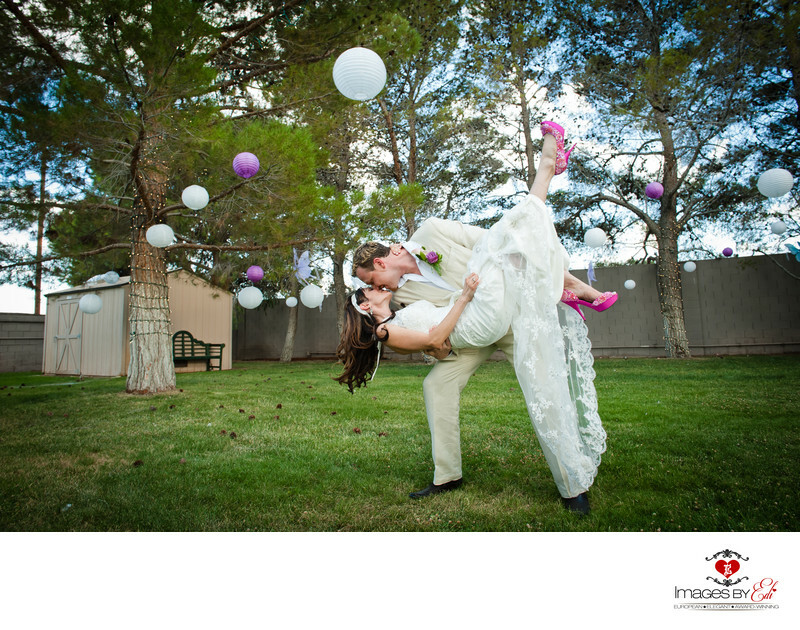 Keywords: Las Vegas Unbeliavable Wedding Ranch Weddings (6), Las Vegas Wedding Photographer (624), Las Vegas Wedding Photography (642), Wedding couple Passionately kissing (3).